2016 Convening sessions are categorized into one of five tracks: workforce development, entrepreneurship and business, neighborhood development, social cohesion and equity, and organizational capacity building. We know from research and practice that positive messages resonate with communities of all kinds. Bring your challenges and successes with messaging to share. Discussion may include: what messages help bridge divides in communities that have traditionally faced discrimination and inequity? How do you make the case for immigrant inclusion in legacy cities? The current election year has thrust immigrants and refugees into the political limelight, and not always in a factual and flattering way. This discussion will encourage local policymakers and advocates to reflect upon the on-the-ground advances being made in Municipal IDs, language access policies, municipal and county welcoming plans, and other state and local public policies that impact integration. 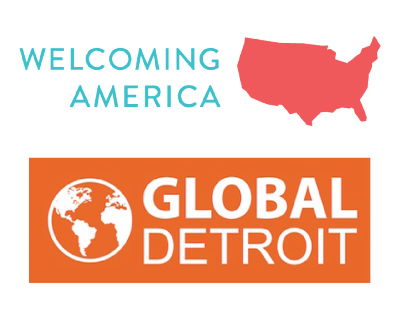 Welcoming America is launching a new program to formally certify cities and counties as welcoming. Come learn more about how your community can get involved and potentially become one of the first communities to meet the highest standard of welcoming. Germany and the U.S. have faced a number of challenges in recent years related to welcoming newcomers, and both have much to share with each other. The Welcoming Communities Transatlantic Exchange provides U.S. and Germany city delegations the opportunity to visit and learn from promising practices related to refugee and immigrant integration and building welcoming communities. Participants from the WE Global region will discuss their impressions from visiting Germany in Fall 2016 and what they’ve found most applicable to their localities. Details on the 2017 selection process will also be shared with potential applicants. Join a special conversation among those studying local, state, and national integration efforts and for an exchange around common research interests, to discuss how empirical research can help advance the welcoming communities movement. Starting with an overview of the field of immigrant workforce development and best practices in skilled immigrant career pathways/ladders, the panel will then address how the Workforce Investment Opportunity Act can play a role in enhancing immigrant career pathways. You will also learn about a successful skilled immigrant workforce development program in Michigan. In this interactive workshop, participants will engage in group discussions around the triumphs and challenges associated with starting/growing immigrant entrepreneurship programs. Experts will facilitate conversations that help participants learn from the work of the most innovative and successful programs from across the region. Intended for those entering the immigrant entrepreneurship sector, or those expanding into new programming areas. This interactive session empowers participants to connect their local immigrant economic development or immigrant welcoming work within their region’s economic development mainstream. The session will work participants through a series of questions designed to assist them in developing a frame by which mainstream economic development actors will be inspired by their immigrant economic development and welcoming work. Receiving community members are encountering increased anti-refugee and anti-Muslim sentiments. Many community champions have stepped forward to welcome their new neighbors and help them build a new life. This session will feature promising examples from Welcoming America’s toolkit on addressing anti-Muslim backlash, Neighbors Together, and will lift up efforts in the region to promote a positive, united vision in our communities. Lending circles, entrepreneurship programs, and other asset-building endeavors are helping build wealth in immigrant communities and African-American ones. Learn how specific asset-building endeavors can be part of the larger struggle to build a more equitable America. WE Global Network and the Fiscal Policy Institute will unveil groundbreaking research and an online tool to assist local housing advocates, land banks, and community development practitioners to quantify the potential of immigrant home ownership and vacant property acquisition. This session will include a discussion of next steps to build upon these insights. Learn more about how municipal code enforcement works and how it can both be a challenge as well as a tool for building a stronger economy and quality of life in your community. This session will provide a broad background on code enforcement and related local government regulations, highlighting some of the particular issues that arise in immigrant communities, and exploring how local governments and community organizations can build neighborhood partnerships to create more positive outcomes for both. International students at U.S. universities represent a growing segment of the talent pool that companies and regions need to remain competitive. As an international student, however, the path to securing a position is far from clear. In this session, hear how H-1B sponsorship happens from the inside. Dan Beaudry, former head of campus recruiting at Monster.com and author of Power Ties, will share how H-1B visas are won in ways you likely don’t expect. You will also walk away with a practical example of programming that supports students in their search. Healthcare is a critical sector, employing millions of people, generating billions of dollars in wages, and saving countless lives across the country each year. However, the growing healthcare needs of an aging population, coupled with acute shortages of healthcare workers, are straining the sector. Immigrants—foreign-trained physicians, researchers, nurses, health aides, and hospital workers—are key to the future vitality of healthcare in the United States, yet they face barriers in putting their much-needed skills to work. This session will explore broad trends in the healthcare sector, with a special focus on Midwestern and Rust Belt states, and will offer examples of local programs that put immigrants to work in healthcare that can be replicated in communities across the country. This session explores two critical entry points into the workforce for immigrants and refugees: survival jobs and gateway jobs. We will discuss how they differ and why you should build both gateway jobs and survival jobs into your regional workforce development strategy. Hear perspectives from an employer, a public official, a non-profit service provider and an immigrant jobseeker. This workshop will discuss the challenges and benefits of including immigrant voices in the decision making process of service organizations and local communities, as well as through the electoral process. A panel of field experts will address questions around short and longer term civic engagement processes and how to build consistent practices in this area. This hands-on session will help you develop an effective voice on social media. Better understand how and why social media can be useful to your mission in the overwhelming and oversaturated world of social media engagement, and learn best practices for posting impactful content and engaging your audiences. This session is for members of organizations with limited capacity to create or implement a social media strategy. Research indicates that limited English proficiency is one of the most significant barriers college-educated immigrants face in utilizing their professional training in the U.S. Basic English instruction is limited in its ability to address the communicative skills necessary for professional success. In this session, we will explore models of contextualized English and their impact on successful integration of immigrant professionals into the workforce. Join an interactive discussion on how best to engage employers in immigrant integration efforts. Hear from state offices of New Americans and non-profit practitioners about what’s working for them, and bring your ideas to the table. This session will explore creating access to capital for immigrant communities. Panelists will share experiences with lending circles, credit-building activities, micro-lending for businesses and other programs to help create access to capital for immigrants in a variety of settings. Is your business community actively involved in your immigrant welcoming and integration programs? Regional Chambers of Commerce across the country are increasingly involved in supporting – and in some cases driving – the inclusion of immigrants in economic and workforce development plans and initiatives. This session will explore concrete ways in which local governments and nonprofits can build relationships with their local Chambers and discuss practical steps for developing that collaboration over time. Cincinnati and Des Moines, two chambers leading the way, will bring their best ideas to help participants craft a plan for action. Research data can be a powerful tool for case making and program development, but it’s often hard to know where to start. This session will explore the basics of impact research, from qualitative and quantitative research approaches to the ins and outs of partnerships with research institutions. Social justice movements generally fall into two categories: for equality and individual rights, and for economic justice. What ties these movements together, and how do they fit into larger conversations to which programs and policies are developed? This session will feature the efforts of three key movements, Black Lives Matter, LGBTQ, and Welcoming. Participants will hear from leaders in each movement and discuss how these groups are working to move their initiatives forward, while addressing the various identities of their members.